For a good walker this is a magnificent itinerary using the paths we know that take you into the wilds, along unspoilt valleys full of wild flowers, wildlife and lakes. Within the natural beauty of the national park. You stay some nights in refuges in some of the most beautiful and isolated places in Europe. The Italian Lakes has five major lakes. Britain's Lake District has less than 30 lakes, tarns and reservoirs. The Pyrenees Lakeland has over 300, but it's not just about the numbers. In spectacular locations in the high mountains (most well above the height of Helvellyn) with blues skies and 10,000 feet snowy peaks reflecting in their glacial waters, yet bordered by a wealth of wildflower Alpine meadows and proud conifers, many of these lakes are "picture perfect". Your guide knows the best - and often least frequented - paths as well as the geology, the flora and fauna (including wild boar, ermine, chamois, marmottes, grouse, vultures and eagles) the local history of walking and climbing, the traditional farming methods, the typical dishes and drinks. (S)he, therefore, adds to the wealth of your experience, and deepens your understanding and appreciation of our beloved Pyrenees. You also stay high up in the mountains, so can truly immerse yourself in this unique environment. Lourdes: We meet you at Lourdes airport (daily flights from London Stansted) or rail station (express trains from Paris and Toulouse), and take you to your Lourdes hotel. The three star Hotel Beausejour delivers what its name promises: a beautiful stay. It is a fairly grand building with spacious terraces and gardens, a heated swimming pool, and an innovative restaurant. A frequent shuttle whooshes you into the historic centre, so all in all, a good start. Transfer time: 10 minutes from the airport. Lourdes - Bareges: You have the day to explore Lourdes, and walk in the surrounding area as you wish before a late afternoon short drive up into the Pyrenees proper gets you to the scenic mountain village of Barèges where you will check into your hotel, and meet your travelling companions (minimum 5 including you, maximum 15) as well as your bi-lingual qualified mountain guide, who also knows the region exceptionally well. (S)he will give a presentation about the Neouvielle nature reserve, Pyrenean lakeland, and your walking journeys over the next few days. The Hotel Grand Bivouac is a one star centrally located hotel. Bareges - Glere: Here we go walking uphill out of Bareges to soon join ancient tracks used for the transhumance (taking cattle and/or sheep up to, and down from, their high summer pastures) passing abandoned farms, barns and shepherd huts, walking alongside tumbling streams punctuated with waterfalls, all the time gaining altitude and solitude. We walk up to 7,200 feet from where we not only get to enjoy magnificent views all around, we, hopefully, get to meet Denis, a shepherd and cheese maker, and taste his superb cheeses in quite stunning surroundings. We then descen a little to our night's stop at the Glere refuge. The Glere valley is truly unspoilt - protected and much less visited than other areas nearby - and consequently it's a privilege and a delight to spend a night here. Look out for chamois, grouse and vultures during daylight hours, and "swim" in the night skies free of almost all light pollution. In the morning, lakes in the valley and granite, snow-covered peaks rising upto 10,000 feet all around. As you would expect, accommodation is simple with shared dormitories, but there are private showers, and plenty of satisfying food. Walking time: 5-6 hours. Elevation: + 900m / - 100m. 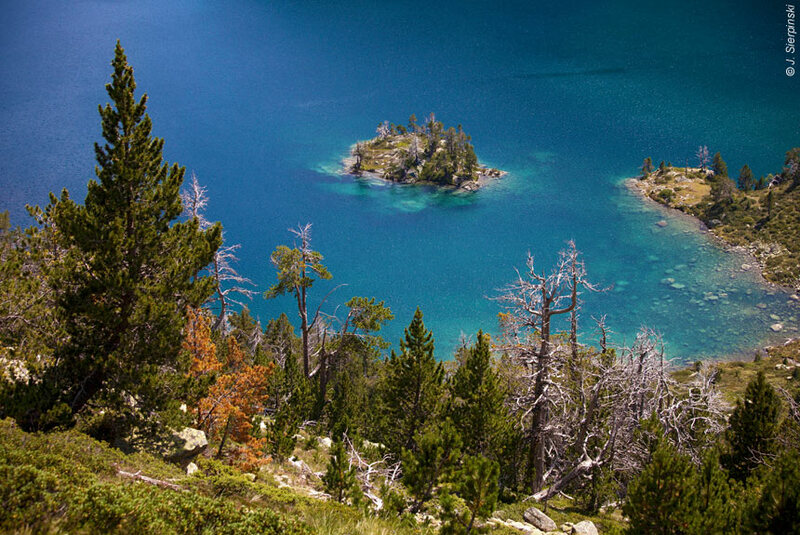 Glere - Bareges: From the refuge, our guide takes us on a superb cirular walk that features some glorious lakes that reflect blue skies, snowy peaks, granite cliffs, woods and Alpine meadows in the still, clear (and oh so cold) waters. 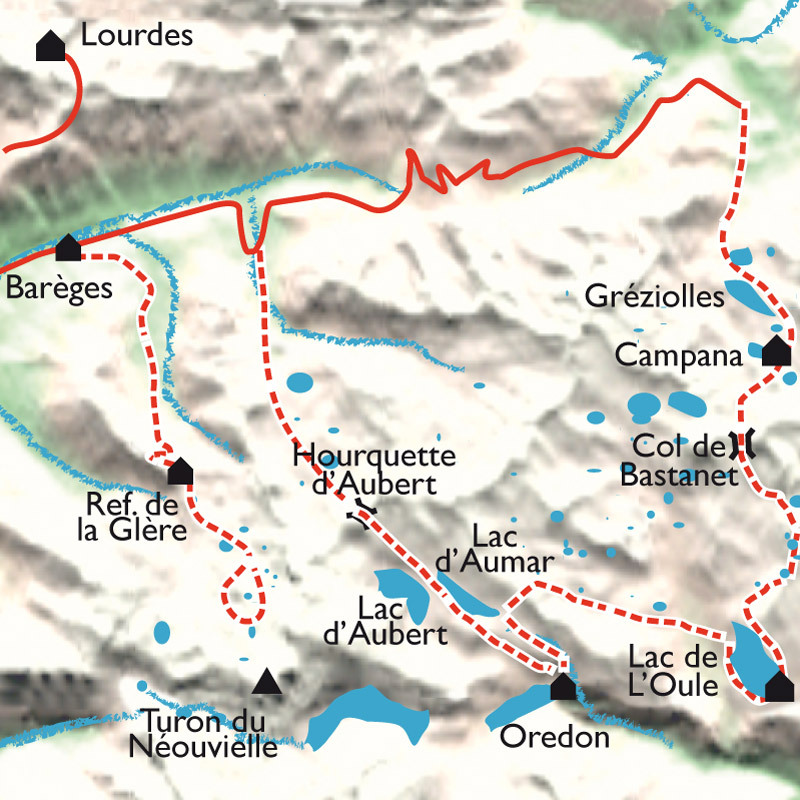 Det Mail, la Mourèle, and Mounicot are some of the favourite lakes we will visit. In early summer you will also find bright colours washing across the valleys as wild flowers and rhododendrons compete to win your attention. When we arrive back at the refuge, there is time for relaxing before setting off down the Glere valley - count its 12 lakes - eventually arriving back at Bareges for the night. You stay again at the Hotel Grand Bivouac. Walking time: 4-5 hours. Elevation: + 200m / - 1,000m. 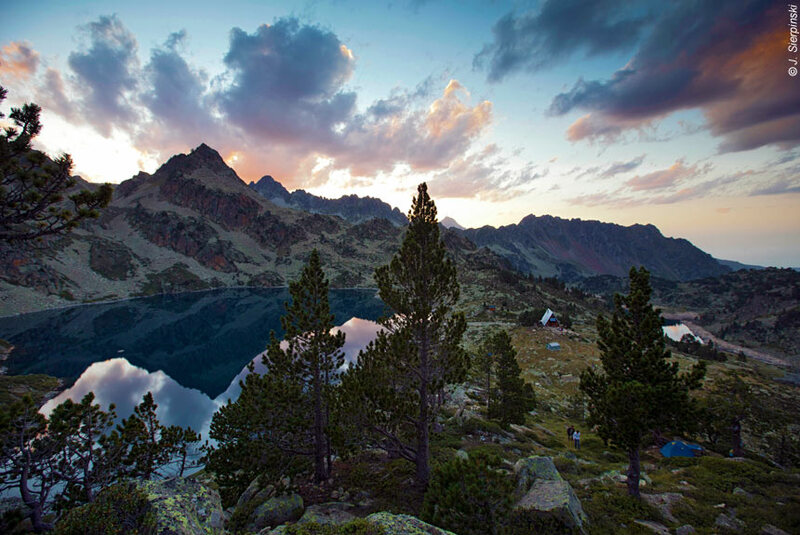 Bareges - Oredon: This is an unforgettable day in the heart of the Pyrenean lakeland. A short transfer avoids the boring bits, and we start walking at the ancient stone bridge - the Pont de la Gaubie - where the Dets Coubous valley begins. The footpath gently zig-zags up to walk beside tarns, ponds, lakes edged with water lilies, and surrounded by meadows of wild flowers, wind sculpted pine trees, and, high above, snowy summits. Lake succeeds lake as we slowly climb to Hourquette d'Aubert col (8,200 feet). Looking back you'll see them ranged below you as well as the rather larger and more magnificent Aubert and Aumar lakes. But we've still got the joys of a gentle valley descent alongside lakes and streams through small woods and across marmotte populated meadows to the welcoming "chalet-hôtellerie" of Orédon overlooking its namesake lake. There's the option of taking a public minibus to save the last 45 minutes or so of walking, if you wish (decide and pay at the time). The "chalet-hôtellerie" Oredon is wonderfully located overlooking its large lake with trees running right to the waterside. It has a sunny terrace and good cafe/lounge inside, but this is one step up from a refuge (and not to be confused with the refuge of the same name), so still fairly simple albeit with comfortable beds, good showers and plentiful food as well as a welcoming ambiance. Walking time: 5 hours. Elevation: + 1,000m / - 650m (not taking the public minibus). Transfer time (at the beginning): 5 minutes. 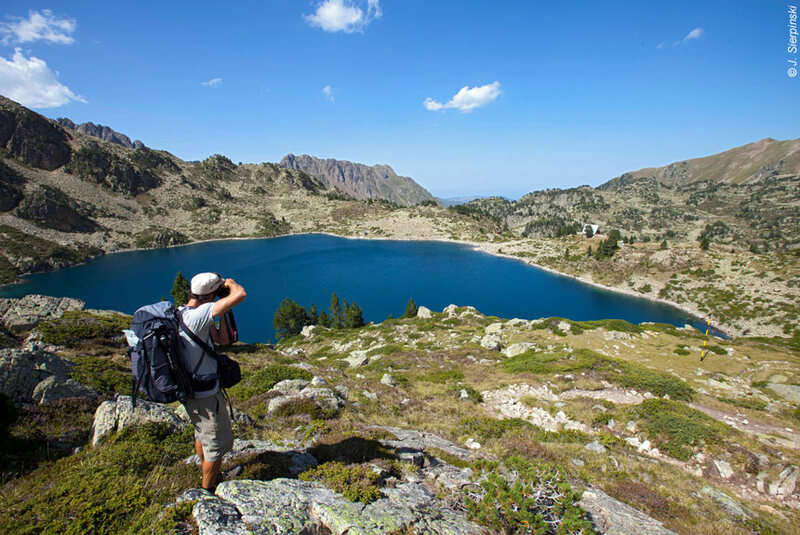 Oredon - Oule: We start the day's walking with a gentle climb up to a natural balcony above the magnificent Aumar lake in which we see the huge reflection of the 10,000 feet Néouvielle mountain lit perfectly by the morning light. Then it's on up a little higher to the Aumar col and the glacially formed, suspended valley called Estibère, which has given birth to a large family of lakes and ponds interspersed with pine forests and open high pastures coloured by wild flowers, especially in early summer, and all of it wrapped in a ring of mountain peaks. What's more you get to stay in this wonderland. The Oule refuge, like the previous night, has its own namesake lake, superb 360 degree views, and an impressive isolation that might leave you feeling both small in comparison to the landscape and privileged to be there. Again, it's the sort of simple hosptitality, accommodation and meals that feel right in such a location. Walking time: 5 hours. Elevation: + 520m / - 550m. Oule - Campane: Talk about saving the best til last...This is a comparatively short walk (maximum 4 hours), but absolutely packed with highlights and delights. 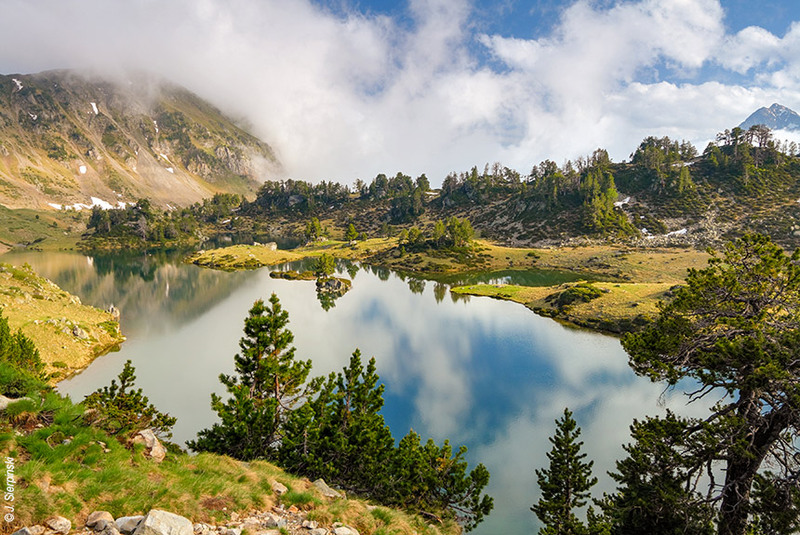 All the time you are deep and high in the heart of the Pyrenees walking along valleys without roads or buildings, and up over cols with barely a visible path. The valleys offer lake after emerald lake, plus pine forests, Alpine meadows strewn with wildflowers, and wild animals spotable at distances near and far. 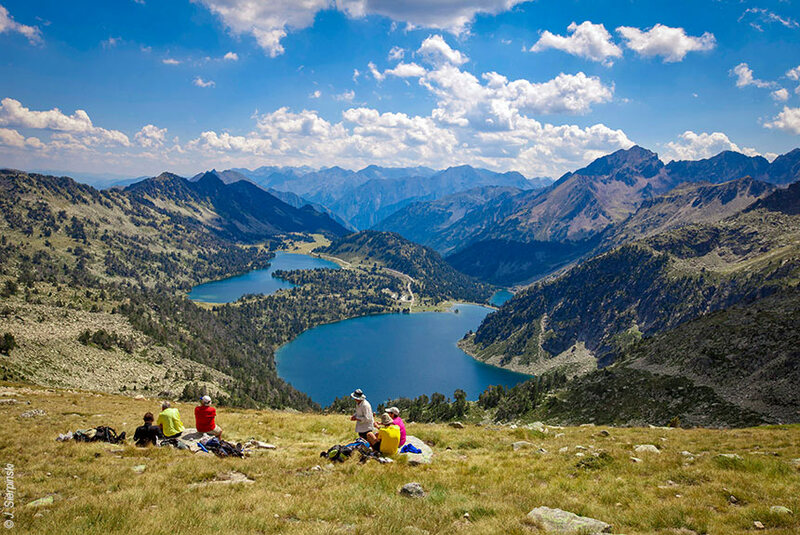 This could be the Pyrenees at its very best, but that's for you to decide. To end your walk in the valley of the lakes of Gréziolles is great, but to then stay the night up there, well that its pretty hard to beat. The Campana Cloutou refuge is a comparatively small, wooden A-shaped building beautifully located above its own lake (again!). The refuge's translated website talks about "sleeping melancholy in these chaotic places, but so grandiose in their poverty and so endearing". We probably wouldn't say that, but rather that we are sure you will enjoy this, your last night high in the Pyrenees, and we think you'll never forget it for all the best reasons. Walking time : 3,5-4 hours. Elevation : + 700m / - 300m. Campana - Artigues: This last day begins with a memorable walk down the beautiful Campan valley to the village of Artigues where we have arranged showers and lunch. After lunch, we take a last long look at these mountains that have been our home for a week, then it's back to civilisation as we take you to Lourdes airport or rail station. Walking time : 1,5 hour. Elevation : - 1000m. Transfer time : 45 minutes. We collect you from, and take you back to, Lourdes airport or rail station. This holiday features challenging walking with some long and arduous slopes, usually 5 hours or so a day, so is only suitable for people who are reasonably fit, and well used to all-day hill and mountain walking. We offer many other holidays that are based on much more comfortable walking than this one. It can get fairly hot in July and August (but nothing like as hot as the Mediterranean) as well as a little more crowded, especially at the refuges, which are often fully booked in high summer. We would recommend from mid May through June, and from mid August through September as the best months. We transport your luggage for you, so all you need to carry when walking is a daysack with whatever you regard as essentials, and your picnic, except on the nights of days 3 and 7 when vehicles can't get to the refuges, so you will need to take an overnight change of clothing (or not bother!). This holiday is led by an experienced, bi-lingual guide with mountain walking qualifications and a wide knowledge of the region. You need only speak English if you so choose. One night in a 3 star hotel with swimming pool; 2 nights in a one star hotel; 1 night in comfortable but simple refuges with small dormitories; 3 nights in high mountain refugers with simple dormitory accommodation. There are private showers available in the refuges, but you may have to queue (in high season) and pay a small fee locally. You will eat simply with an emphasis on naturally produced, local sourced products, and family style cooking. In the refuges you will often be served at the same time, and sit on communal tables. Breakfasts are usually buffet style, and you will receive a picnic every walking day. Journeys by road are by bus, minibus, or taxi.